My friends and family would probably say that I'm slightly obsessed with London, and they would be wrong: I'm totally obsessed! For those long, arid stretches of time between trips, I try to read as much as possible about my favorite city. 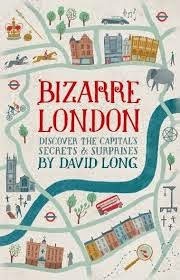 The book Bizarre London: Discover the Capital's Secrets and Surprises is just the sort of book that I can't get enough of. Of course a city with such a long and illustrious history as London is filled with locations and stories that are well-known to most people, whether they are particularly interested in London or not. But this book is filled with tons of interesting facts, presented in unusual categories, which make for fascinating reading. The chapters of the book contain both straightforward topics (Royal London, Working London, and Sporting London, to name a few) as well as some you might not expect (Eccentrics' London or Gruesome London). Each chapter has many interesting lists included, covering things such as Famous Buildings with Secret Histories, Underground Oddities, Worst Business Decisions Ever Made, and London's Weirdest Wills. There are also plenty of interesting lists, such as the 108 Livery companies, London's Oldest Shops, and 20th Century Traitors. And what modern book about London would be complete without a delightful selection of quotes from the inimitable mayor, Boris Johnson? In short, each page features a fascinating story or character that will keep you reading until, suddenly and with a shock, you realize you're already at the end! I really loved all the strange and new information and the black and white illustrations were a perfect fit. If you have any interest in London, history, or just random/unusual trivia, this is a great book for you! Final Verdict for Bizarre London: Five Gherkins, for being a beautiful little volume that's packed full of interesting stuff!